Blunderbuss doubles down on the White Stripes' singer's long lyrical campaign against females he can't control. Women have long been up to no good in the eccentric world of Jack White's songs. But on Blunderbuss, his solo album out this week, they finally indulge in White's most famous bugaboo: cell phones. "Two black gadgets in her hand are all she thinks about," White spits about a female antagonist on "Freedom at 21," before getting Pat-Robertson-preachy: "No responsibility, no guilt or morals cloud her judgment." There are other strange transgressions by women against men on Blunderbuss. During the opener "Missing Pieces," a girl figuratively amputates White's limbs. Later, on "Sixteen Saltines," he cowers before a woman whose "spike heels make a hole in a lifeboat." White as a lyricist has been obsessed with women for more than a decade now, perhaps to a greater extent than any other rock star in his generation. Certainly, he's got more girl problems than any of his blues-rock contemporaries. Dan Auerbach of the Black Keys will call women "psychotic" and lament exes, but it rarely gets personal the way it does with White. Spoon's Britt Daniel waxes flirtier and artsier. In fact, with his nasty barbs and self-pitying complaints, White's lyrics almost have more resemblance to early-2000s emo bands like Fall Out Boy and Panic! At The Disco. But Blunderbuss, more than anything that's come before it, crystalizes White's longstanding issues with women. Maybe that's because it's his first-ever solo record, and maybe that's because it comes on the heels of his second divorce, from model Karen Elson. Either way, what it reveals is fascinating—though not pretty. In one of his first ever on-the-record comments about gender, White told Josh Eells in the New York Times magazine recently that he doesn't want to define roles for the women he knows: "I've always felt it's ridiculous to say, of any of the females in my life: You're my friend, you're my wife, you're my girlfriend, you're my co-worker. 'This is your box, and you're not allowed to stray outside of it.'" But as White avers in the same interview, he often stretches the truth with reporters, and his statement makes more sense in the context of his music when it's flipped: What White really seems to dislike is when women choose their own boxes. He's a famous control freak, and in his songs, women are constantly threatening his control, forcing him into playing the role of victim. His response? Vitriol. His White Stripes tracks mostly break down into three loose categories: gallant nursery rhymes ("We Are Gonna Be Friends," "Hotel Yorba"), vague badassery (much of Elephant), and most commonly, passive-aggressive romantic retaliations (just look at the titles: "Why Can't You Be Nicer To Me? ", "I'm Finding It Harder To Be A Gentleman," "A Martyr For My Love For You"). Lyrically, White's need for control often takes the traditional trajectory of wanting women to be quiet and submissive. We can see this pattern emerging in Stripes lyrics early on. "Let me see your pretty little smile, put your troubles in a little pile / and I will sort them out for you / I'll fall in love with you / I think I'll marry you," White croons in "Apple Blossom" off 2000's De Stijl. On Get Behind Me Satan, he falls in love with a ghost and half-brags that he's literally the only man who can see her. * But even being too meek is also a sin in White's world. In a scene from the 2007 documentary Under Great White Northern Lights, Jack lashes out at Meg White backstage for speaking too quietly. What happens when White's women aren't timid—when they themselves try to exert some control? Then, he makes it clear that he can't please them, nor does he care to. When a woman (who may or may not be his mother, according to the song) demands something of him on Elephant's "The Air Near My Fingers," White retorts back, "I never said I wanted to be a man." On "There's No Home for You Here," he sings, "It's hard to look you in the face when we are talking / so it helps to have a mirror in the room." Presumably, the mirror's needed so he can focus back on who really has the power. And on "Girl, You Have No Faith In Medicine," the title is a patronizing chide. So we come to Blunderbuss, more than 10 years after Jack and Meg first sang their hopscotch ditties in matching red pants. A large part of the record is spent cataloguing the sins of some powerful, self-possessed, ultra-feminized woman—a wearer of lipstick and stilettos, who "gets what she wants" and, in doing so, torments him. In "Hypocritical Kiss," White spins his foil's feeling rights back around in an instance of blatant manipulation: "I know that you're mad at me / But if you're thinking like that / I think you'll see that you're mad at you too." And when he can't please women, he still doesn't give a damn; going upstairs to find his girl crying as per usual in one song, he sniffs, "I guess I should go back to bed." There's even a startlingly specific zing at Meg White on "Hip (Eponymous) Poor Boy": "You'll be watching me, girl, taking over the world / I'll be using your name." In this context, White's dismissal of a 21st-century woman in Blunderbuss' "Freedom at 21" makes perfect sense. A modern-day woman, with her sexual freedom and iPhone, represents power and choice, things that White embraces in his own life. But she's come by this in a way that's not on his terms, so she's a villain. 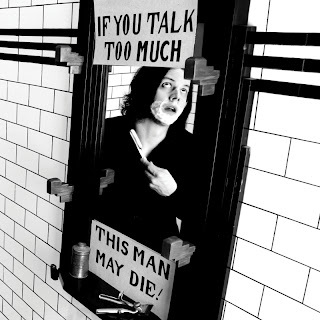 What's the real-world upshot of Jack White's need for control? Perhaps it bubbles up in his strictly color-coded set décor and on his current tour for Blunderbuss, where he's switching between all-male and all-female backing bands based on his own whims. Perhaps there's some truth to Rob Sheffield's characterization of White as a minter of female rock stars—first with Meg White, then with Alison Mosshart for the Dead Weather, and a whole host of ladies on Third Man, his record label. In this way, he's still in control, diligently shaping them to fit into whatever feminine niche he picks, be it wild rock banshee (Mosshart) or cryptic goth chicks (The Black Belles). He produced then-wife Karen Elson's record on his label and then played in her band, seemingly not trusting another soul with his wife's career. The she-devil/my-baby-wronged-me viewpoint is an old one, marbled into the blues and rock musical traditions White's mined so fruitfully for so long. But White's songs come with something else as well: the image of a man who thinks he's too good for this world, beset on all sides by too-convenient technology, vapid friends, and, yes, pushy women. "If you talk too much, this man may die!" cautions two signs in a promo pic for Blunderbuss, mimicking an old WWII poster, next to a mirror that reflects White holding a razor. Ladies, you've been warned. *This post originally stated that the song "Little Ghost" was on Elephant. We regret the error. Jessica Misener has written for The Huffington Post, The Awl, Spinner, The Hairpin, Under the Radar, and others.